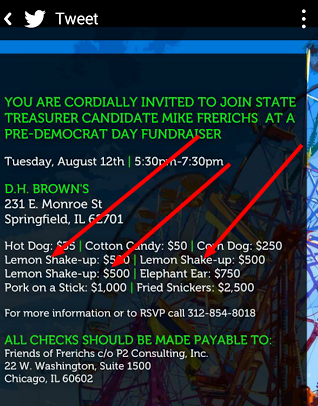 Compounding the misery that is the social media errors from Illinois State Treasurer Candidate Mike Frerichs and his latest Twitter gaffe (see the Tweet that the Frerichs campaign deleted here) is that the folks who set up the fundraising donation page have made their own mistake. 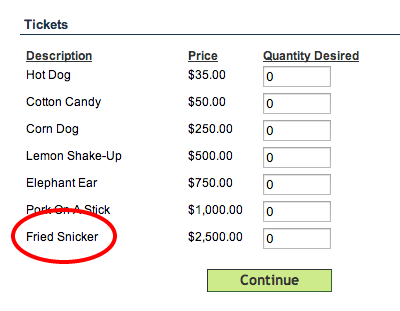 As you can see from this screenshot, in addition to having THREE different "Lemon Shake Up" levels of sponsorship, they also have something called the "Fried Snickers" level for $2500.00. Snickers with an "s". That's the proper brand name. Unfortunately, the folks who created the form where you can donate (see it here on Frerichs' site), didn't bother to read the invite so they decided to drop the "s". Now...this normally isn't that big of a deal: they dropped the "s" in Snickers. But...this is the Mike Frerichs for State Treasurer campaign. They're KNOWN for their mistakes.